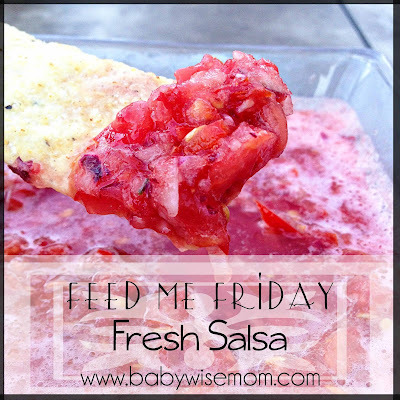 When it comes to making your own homemade fresh Salsa, you can really tweak things so they work with your own tastes. This is how I make salsa. 1 Red Onion. If you don’t like red onions, you can use green onions or chives. You can also use a regular yellow or white onion, but the onion flavor will be stronger and not as sweet. Peppers (your choice) as desired. You can use something more mild like a Garden Salsa pepper or spicier like a Jalapeno pepper. The number will depend on how much spice you like. Garlic cloves. I use about 3-4 cloves. You will want to use what is right for your taste pallet. 1 Tablespoon Vinegar. You can use a lot of different kinds. Sometimes I use Apple Cider Vinegar and sometimes I use Red Wine Vinegar. 2 Tablespoons Lime Juice. This is about one lime juiced. Sugar to taste. I use about 2 tsp. Salt to taste. I use about 2-3 tsp Kosher salt. The amount will vary on taste and on how many tomatoes you use. Tomatoes. Roma are great for salsa because they don’t have as much liquid in them. If you are using Roma, you will probably want 5-10. Finely chop your onion, peppers, and garlic. I usually do a rough chop and then add to a food processor. Add in the vinegar, lime juice, sugar, and salt. Stir (or pulse). Add the minimum salt amount so you can add more if needed once the tomatoes are added. Dice tomatoes. Add to mixture and stir (or pulse). If you are using a food processor, quarter tomatoes and then pulse so you don’t over-chop your tomatoes. Add cilantro if desired. Stir. Taste test. Add more salt if needed. How do you make your salsa? I love to try new ways! Previous Post How Do You Know When You Are Done Having Babies?